Augathella, a rural town, is 700 km north-west of Brisbane, and 75 km north-east of Charleville. 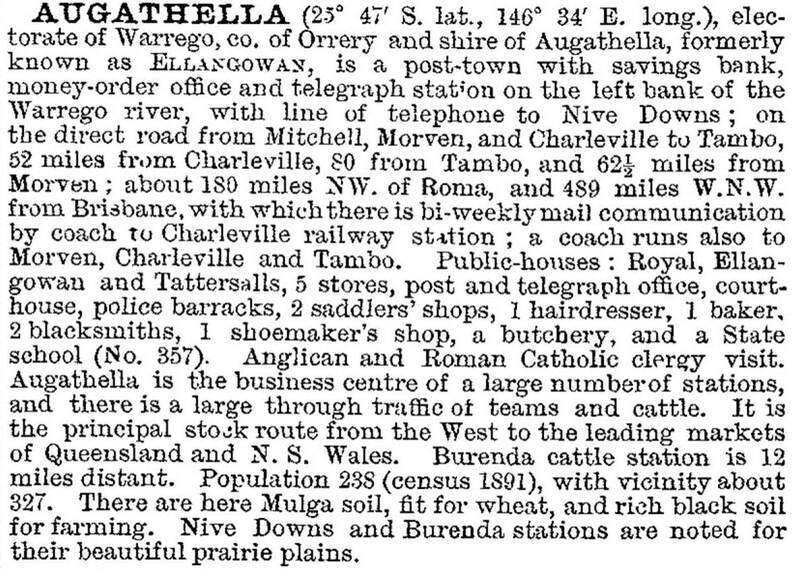 The Augathella district was taken up for pastoral runs in the 1860s, the Burenda station was one of the more important. Tracks from Charleville and Tambo to the Burenda station joined at a camping spot at the Warrego River which was surveyed in 1880 as a township named Ellangowan. The change of name to Augathella, which is thought to have been derived from the Aboriginal word 'thella', referring to a water hole, occurred in 1883, when the town was surveyed. Within a year the railway line at Charleville was connected to Augathella. Both towns were in the Murweh Shire, but when Charleville was made a separate municipality in 1894 Augathella became the shire's main town. At about this time Augathella's population reached 500 people, a level more or less maintained until 1990. The Catholic community opened the St Joseph's convent and school in 1928. Augathella has the Hotel Ellangowan, a motel and caravan park, a hospital, a swimming pool, a racecourse, a community and cultural centre, a visitors centre and a State primary school (1884). A sawmill was opened in 1999. Prone to both flooding and severe drought, a flood levee built around Augathella was breached by floodwaters in 2008, before being reinforced. Plans were first made in 2003 to build the ‘big ant’ an oversized tourist attraction to describe Augathella as the home of the meat ant. The plan was revived in 2009 and in 2011 a 5 metre long meat ant by artist Amanda Feher was finally installed in the tourist park. The meat ants were originally associated with the town through the local football club, players said to be as tough as meat ants. The Augathella Cultural Association created a mural in 2008 on the town's old picture theatre to mark the 50th anniversary of the release of the classic Australian movie Smiley based on a young boy's adventures in the Augathella region.